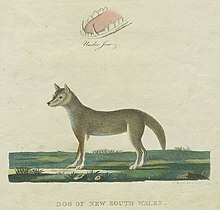 ^ Since interbreeding of dingoes and other domestic dogs is regarded as widespread, occasionally hard to detect, and because no distinguishing feature is regarded as completely reliable, it is not clear whether the observed dogs are dingoes or not. Furthermore in some topics there is no distinction made between dingoes and other domestic dogs. Due to these problems the article will only use the terms "dingo" and "dingo-hybrid" (respectively "dingo-crossbreed") when the used literature named the respective dogs as such. Otherwise the terms dog or wild dog have been taken over from the used literature. ^ Gaisler, J.; J. Zejda (1997) (german). Enzyklopädie der Säugetiere. Verlag Werner Dansien. ISBN 3-7684-2750-1. ^ Macdonald, David (2004) (german). Die große Enzyklopädie der Säugetiere. Könemann in der Tandem Verlag GmbH. ISBN 3-8331-1006-6. ^ Fleming, Peter; Laurie Corbett, Robert Harden, Peter Thomson (2001). Managing the Impacts of Dingoes and Other Wild Dogs. Commonwealth of Australia: Bureau of Rural Sciences. ^ Rose, Deborah Bird (1992). Dingo makes us Human, life and land in an Aboriginal Australian culture. ISBN 0-521-39269-1.